Lightning is stunning and even mystifying to watch. That dash of bright light makes an excellent subject for photographs or videos when taken from a distance. But, did you know that there is such a thing as a red lightning? What Causes a Red Lightning Bolt? Red lightning, or more commonly known as sprites, is an electrical discharge that appears as a burst of red light above the clouds during a thunderstorm. Since this weather phenomenon is very short-lived, with sprites flashing for a few milliseconds, not to mention that this is not visible from the ground most of the time, red lightning is very difficult to observe and even more challenging to photograph. They pretty much live up to the name given to them, inspired by the fantasy realm’s playful air spirits. A red lightning is a form of electrical discharge in the upper atmosphere associated with thunderstorms. A wide electric field that gets generated by several lightning strokes ionizes the air high on top of the cloud. This then emits that light you can see in photos. It begs comparison to the usual lightning bolts you see all the time but it is worthy to point out that red lightning is much higher as its tops can reach up to about 100 kilometers or more. 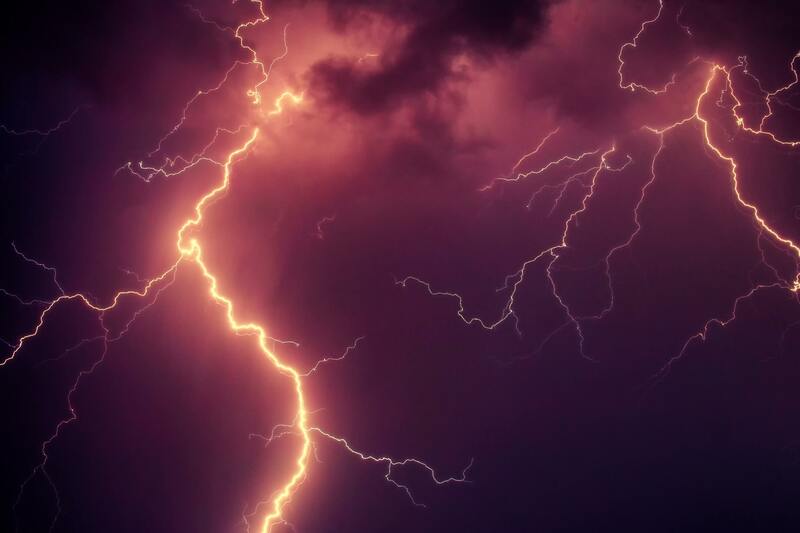 While an ordinary lightning bolt can stretch to up to 10 kilometers from the cloud down to the ground, a red lightning can reach as much as 50 kilometers tall. Red lightning is associated with the positive lightning strokes that take place once the cloud has a positive charge build up and releases a lightning bolt. Negative strokes formed by a negative charge buildup are around 10 times more common. This is why red lightning is not strongly related to the most common type of lightning but it is not that uncommon either. Sprites or red lightning are huge flashes of light appearing directly above the active thunderstorms that often correspond with positively charged and powerful cloud to ground lightning below. Also called red sprites because most of these glow red, these wispy flares can shoot up to 60 miles from the top of the cloud. However, since they are weakly charged and they rarely last more than a few seconds, red lightning cannot be considered as dangerous. The shapes of sprites have been compared to jellyfish, carrots, and columns but their soft glow and faint charge means it is very rare to spot them with the naked eye. The truth is that there were no photographic evidences of red lightning until 1989. However, since then, thousands of red lightning have been filmed and photographed from the ground, from space, and from aircraft. A lightning strike is a high voltage albeit a very short lived electrical current. However, it has different effects to a residential or industrial electrical shock. Majority of lightning fatalities are instantaneous through severe nervous damage or failure of the heart or breathing. Lightning injuries and deaths may occur in 2 ways. This can be through a direct strike or indirectly from being within about fifty yards of the strike. Short-lived electric current may travel through wet grass, damp soil, water, and along the fence wires, underground cables or plumbing. It explains injuries or deaths to those who are indoors, yet in contact with plumbing fixtures, electrical appliances, and telephones. However, the effects of non-fatal lightning injuries are frequently long lasting and severe, frequently life changing. They may include chronic pain and impaired mental ability. Nevertheless, survival is better compared to the alternative and first aid after the lightning strike is crucial. The first thing that you should remember is that injured people aren’t live, you will not get a shock once you touch them. The second is that CPR must always be attempted once the victim isn’t breathing or has no pulse. Lightning strike may stop both or either breathing or the heart. The third is that medical attention can be necessary even though the person seems recovered. Lightning strike may alter your life seriously. In short, always play it safe. Are You Safe in Your House During a Lightning Storm? The most obvious and safest place to be during a lightning storm is indoors. If lightning strikes a building or a house directly, it’ll tend to follow the available path to ground including plumbing, electrical wiring, telephone lines or cables, steel framework or antennas. Once lightning hits skyscrapers, current is safely diverted to the ground. The occupants and the building are not affected. Stay away from any faucets and water pipes. Never use any wired device or appliance. Wireless appliances including razors and cordless phones are very safe to use. Never stand on the patio slab or basement floor or anywhere where excessive moisture or standing water is present. These are the areas that are considered as ground current danger zones. Avoid walls where electrical wiring is present. Take note that lightning will jump through the air inside your home or building to reach better grounding patch including electrical wires to water pipes. It’s essential to stay away from plumbing when there is a lightning storm outside. It includes showers, bathtubs, and sinks. If lightning is happening, never hand wash dishes, don’t take a shower, and don’t give your children a bath. It’s best to wait until the lightning storm ended. You should not also do laundry because dryers and washers are connected to both plumbing and electrical systems. People were reported to be injured while standing and leaning near concrete walls in their offices and homes. It’s due to the metal rebar in the concrete and the metal serves as a conductor once lightning hits your building. Structures including lean-to-shelters, outhouses, bus shelters or any non-metal structure don’t provide lightning protection.